Do you remember watching the 2008 Summer Olympic Games in Beijing, seeing Kerri Walsh with her shoulder taped up and wondering what in the world that was for? That summer was the first time most people saw kinesiology tape, though it has been around far longer than just 7 years. In fact, it was invented by Dr. Kenzo Kase in Japan over 25 years ago when he realized there was no sports taping method that could help to heal injured tissues and muscles. Kinesiology tape is a stretchable cotton fabric placed over a heat-activated adhesive. 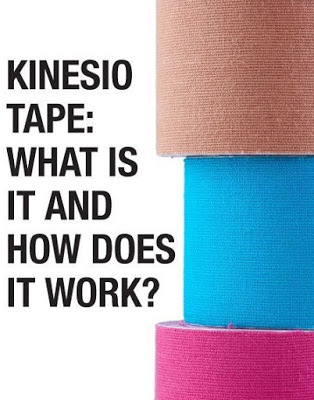 Most types of kinesiology tape can be stretched as much as 140% of its original size. The abundant stretchability is what makes it different from other types of sports tape, such as white athletic tape, used mostly by athletic trainers. When applied properly, the tape will lift the skin and fascia away from the muscle allowing more blood flow into the area. This increase in blood flow promotes more oxygen to the tissues as well as an increase in lymph drainage. Draining the lymph fluid helps to expel byproducts of exercise like lactic acid and helps to reduce swelling or edema. 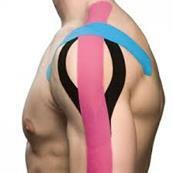 There are three main applications of kinesiology tape: structural, edema reduction, and neuromuscular. A structural application requires stretching the tape towards its limit and is used to help restrict joint range of motion. It can be used on injuries such as ankle sprains, joint instability, and patellar dislocations. Most structural applications will require the addition of another type of tape with limited or no stretch to add extra support. 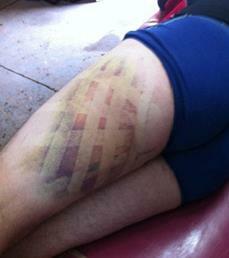 Application of kinesiology tape for edema reduction requires cutting the tape into thin strips lengthwise while still leaving about 15-20% of the strip intact as an anchor. At least two cut up pieces of tape are necessary in order to create a “basket weave” pattern which will create grooves beneath the skin and allow the accumulated lymph fluid to be drawn out of the affected area and reabsorbed into the body. The edema reduction application can be used on swollen joints after an injury, post-mastectomy lymphedema, and can also be very helpful in clearing up large bruises. A neuromuscular application requires very little to no stretch on the tape and can be placed virtually anywhere on the body. The purpose of this application is to improve proprioception (awareness of your own body’s position in space) in the affected area. The application of the tape on the skin triggers the brain to pay attention to that area which can help facilitate the affected tissues. Common conditions that can be treated using kinesiology taping include shin splints, plantar fasciitis, IT band syndrome, runner’s knee, rotator cuff syndrome, and low back pain. 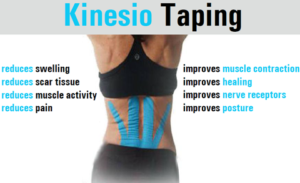 But did you know that kinesiology taping is used for more than just treating injuries? It is often used to promote proper posture, improve performance and endurance, and help support a pregnant belly. A postural taping application uses mild stretch to remind you to correct your posture when you start to slack. The tape itself does not correct your posture, but it can help trigger the brain to train your body to sit up straighter. As stated before, the lifting of the superficial skin and fascia away from the muscles promotes better oxygenation of the muscles. That improvement in oxygenation allows your muscles to work harder for longer, thus boosting endurance and enhancing performance. When you’re pregnant, and the size of your belly increases as your baby grows, your center of gravity shifts which wreaks havoc on your posture and your body. Applying kinesiology tape to support some of the weight of the baby bump can help reduce postural degeneration common with pregnancy. Kinesiology taping can last up to 3-5 days, and can even be worn swimming or in the shower. Most tape brands utilize adhesives that do not irritate the skin, but if you have had previous allergies to adhesives, like band-aids, be sure to let your sports chiropractor know before they apply the tape. If you notice any redness or itching around or under the tape, remove it carefully and immediately to prevent further irritation. As the adhesives are heat activated, NEVER remove the tape during or immediately following a hot shower. The hot water can reactivate the adhesive which will make it much more difficult to remove the tape without taking some skin as a souvenir. There are many YouTube videos and instructional photos on how to apply kinesiology tape to yourself or someone else. But to ensure that the tape is applied properly and for the right reason, go see your sports chiropractor! 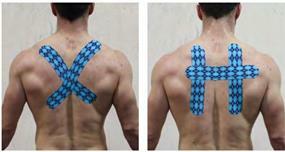 All four chiropractors at Pro Chiropractic are certified in applying kinesiology tape.